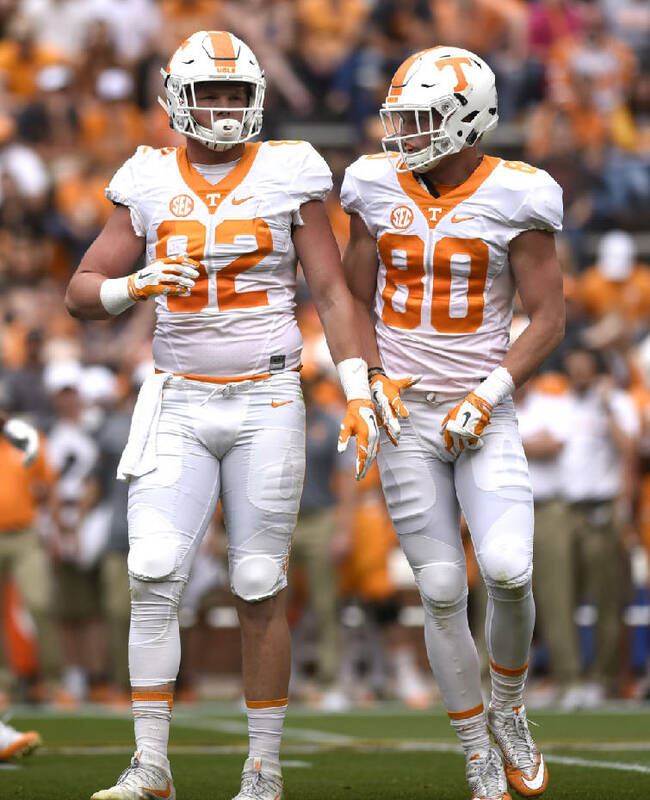 Tennessee teammates and brothers Ethan Wolf, left, and Eli Wolf prepare for the next play during the Orange and White spring game in April at Neyland Stadium. Ethan is part of a senior class that will start the season having won three straight bowl games. KNOXVILLE — The last University of Tennessee football team to enter a season having won three straight bowl games included seniors and eventual NFL stars Leonard Little and Peyton Manning leading a squad ranked No. 5 to start the season. Twenty years after the 1997 Volunteers parlayed their run of success into the school's first victory in a Southeastern Conference championship game plus an Orange Bowl appearance, this season's senior class bears a similarity current coach Butch Jones is quick to point out. This year's unheralded group of seniors will be the first since that 1997 class to enter a season after being part of three straight bowl victories. There are no players of Little or Manning's caliber in this year's class, and few are predicting Tennessee to win any championships. But as this year's group of seniors prepares for the start of preseason camp, some of them expressed similar expectations. "The culture here is that our goal at Tennessee every single year is to win a championship," senior tight end Ethan Wolf said Thursday. "That's going to remain the goal. There may have been a little bit of excitement the first year and maybe the second year of winning a bowl game. It's always exciting to win a bowl game. But that's the bare minimum right now." Tennessee players report for the start of training camp a week from today after a summer spent in the weight room with new strength and conditioning coach Rock Gullickson. Jones also allowed skill players to organize and participate in seven-on-seven passing drills this summer, which Wolf said helped the offense develop timing with quarterbacks Quinten Dormady and Jarrett Guarantano. The workouts also illustrated the leadership-by-committee approach Tennessee has adopted after the departure of key leaders like defensive end Derek Barnett and quarterback Joshua Dobbs — both NFL draft picks — from last year's team. Jones is not selecting permanent captains for this year's team and will instead peg captains on a game-by-game basis. Wolf said the summer workouts have reflected that mentality. "Sometimes we get to talking back and forth with the defense and things get out of hand," he said. "There's always somebody (who clears things up). It's different every day. There's a lot of leadership building on this team, and someone will always get it back in the right direction." At last week's Southeastern Conference media days event, Tennessee was picked to finish third in the SEC East. The Vols finished 9-4 last season, with losses to South Carolina and Vanderbilt wrecking aspirations for a conference championship and leading to diminished outside expectations entering this season. Internally, the expectations remain and the lack of stars on the roster is viewed as a means to ensure early practices will include competition for playing time at nearly ever spot on the depth chart. "Whenever you come into a training camp, it's a new experience and a new trial every year," senior safety Todd Kelly Jr. said. "The mentality for everyone is that your spot is earned, not given. It doesn't matter whether you're a senior or a freshman and played 1,000 plays or 100 plays. We're coming in confident and excited to compete with one another and make each other better." Kelly said if the team sticks together, "then it's going to be pretty special." "A lot of people say that it's not where you start but where you finish," he said. "That's what I truly believe. You hear about guys that were no names making it to big names. I think that speaks with our team. It doesn't matter where we start, it's all about where we finish. "Right now we're in the weeds. No one is really seeing us, almost like a snake in the grass. Our goal is to end up biting somebody at the end of the day and making them pay."